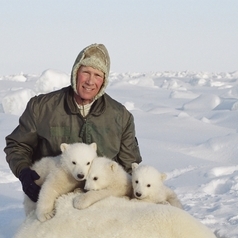 Dr. Steven C. Amstrup is chief scientist for Polar Bears International. He also is an adjunct professor at the University of Wyoming in Laramie. Previously Amstrup was a research wildlife biologist with the United States Geological Survey at the Alaska Science Center, Anchorage AK., where he led polar bear research in Alaska for 30 years. Amstrup has authored or coauthored over 100 peer-reviewed articles on movements, distribution and population dynamics of large mammals, and is the senior editor of a recent text on population estimation methods. In 2007, Amstrup led a USGS research team in production of 9 reports that were instrumental in convincing the U.S. Secretary of Interior polar bears should be declared threatened under the U.S. Endangered Species Act. Most recently Dr. Amstrup led an effort showing polar bears are not unavoidably doomed. In the December 2010 issue of Nature, he and his coauthors showed that preserving polar bears is all about controlling man-caused temperature rise. In 2012, Amstrup was selected as recipient of the Indianapolis Prize and a Bambi Award for his efforts in animal conservation.